Battlecry: Destroy a Murloc and gain +2/+2. Murloc. It's what's for dinner. 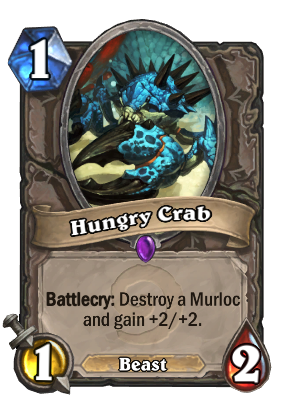 With the Patches nerf, the era of Golakka Crawler has ended, ushering in a new dynasty ruled by Hungry Crab as Murloc Paladins swarm the Standard ladder with Call to Arms vomitting endless streams of crab chow. It's good to see one of my very first epics of hearthstone making a return. I love him so much, a tolerable one drop oftenly, but every so often, a snip snapping terror against paladins. More like this guy made a bigger comeback than Liverpool against Milan in Istanbul CL Final.. Discovered it from Dark Peddler to kill poor Murloc Warleader. Nope, the game considers Morgl as not being a Murloc even if its portrayed by one. And because of this, it does not gets murloc buffs like Grimscale Oracle or Murloc Warleader. This guy is MVP in battle of the builds Tavern Brawl. In fact the murlocs rule all. Your time has come, old friend. Combo this with Brann Bronzebeard and now you're talking double murloc removal with a 3/4 and a 5/6 on the board. Not bad! Now that people are bustin' nuts over Murloc Knight this guy might make a come back. Secret Pally and Aggro Pally do not run this card according to Tempostorm. Midrange Paladin (a tier 3 deck, mind you) runs 1 to 2 copies. I don't think it's worth including a card that's almost always a 1/2 for 1 textless to sometimes counter Midrange Paladin is wise. Two years almost to the date later and this man's words speak true. I have it eat my cheap murloc after I use power overwhelming on the murloc. Maintains board presence.